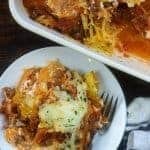 Spaghetti squash casserole with a creamy cheesy filling! Preheat oven to 400 degrees. Spray a rimmed baking sheet with non-stick spray. Cut the spaghetti squash in half length-wise. Scoop out the sides and discard. Drizzle the inside of the squash with olive oil and sprinkle with salt. Place spaghetti squash flesh side down on the prepared baking sheet at bake for 1 hour or until fork tender. Use a fork to scrape out long strands of squash, scraping across the width of the squash. Brown the ground beef over medium heat in a large skillet. Drain the grease and add the marinara to the pan. Cook for 5 minutes over low heat to heat through. Add the cream cheese, sour cream, and parsley to a small mixing bowl and stir well to combine. Preheat oven to 350 degrees. Spray a 9x13 baking dish with non-stick spray. Place half of the spaghetti squash in the prepared baking dish. Top the squash with half of the meat sauce and all of the cream cheese mixture. Add the remaining spaghetti squash followed by the remaining meat sauce. Sprinkle on the grated mozzarella. Bake for 20 minutes or until cheese is melted and casserole is hot. Scrape the spaghetti squash length-wise for short strands of squash or width-wise for long strands of squash.